No amount of honest skill will guarantee a win in craps. Any number can come up in a dice throw irrelevant of how good a player is. If a player is good, he is most likely just having a very lucky day. It is not because he has already devised a way on how to win in craps every single time. In any case, the best tip to give is to be calm all the time when playing crap. This is especially helpful when you are in the middle of a losing streak and you are about to blow your temper. Be sensible all the time and do not lose your temper. Know when to stop when you think you should. If you still want to continue, make sure to protect your bankroll. It is easy to be engrossed in a game when no one is watching you. Be aware of your personal capacity and set a limit as to how much you could spare even if you do not win. Be absolute and firm, so that if you decide to lose not more than $500, stand up and walk away when you have lost this much. In the same manner, manage your winnings wisely. If you win and double your money, do not bet all of it again. Go back to the first tip about keeping your calm and not being engrossed. Many people will advise you to bet only 20% of your winnings. If you want more, say 50%, it is also okay, so long as you can deal with the consequences if you lose it on the next round. The problem with craps is that it is simply hard to predict a win or a loss. Anything can happen. Bear this in mind whenever you place bets on the table. Luck will not always be at your side. Play craps because it is fun and entertaining. Another tip to consider is to first know and be familiar with the many betting options available in craps. It will help you strategize because different bets have different house edges. 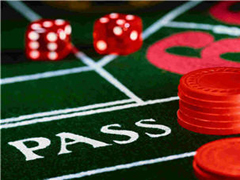 Some of the most common bets used in craps are the Pass Line bets, Come Bets, Place Bets on 6 and Place Bets on 8. If you are a beginner, it is advisable to first stick to the more popular and safer bets. As you gain experience overtime, you could begin experimenting by using other types of bets and see which works better as compared to your playing style. The same goes with the amount of bet you place on the table. If you are just a beginner, you might want to stay on the conservative side for the meantime. As you gain experience and understand the odds better, you could begin to vary your bets and be more risky when you feel you have the game going right for you. At the very least, aim to lower the house edge to increase chances of winning in craps. You can practice controlling your dice throw that is not actually cheating. Practice your technique and keep it constant. Meaning, try to roll dice the same way each time rather than making it random. You will have better control of the game this way. The idea is to control as many variables as you can because the number come-out is out of your hand. Another tip is called the hit and run. It takes a lot of self-control and discipline to stand up and call it quits after a win. Walk away a winner as much as you can. Know when to hit and when to run. When hitting, you can hit it big by wagering on long odds that are awarded with bigger payouts as compared to short odds. But the chances of winning are slim. It�s a personal decision to make. Most players will settle with small winnings but with bigger chances of hitting a number correctly. There will be bad days and good days in any casino game. As the famous adage goes, strike while the iron is hot. If you are on a winning streak, it is good to continue playing (while still taking care of your bankroll, of course). If you are having a bad day on the other hand, it might be better to pull away. Tomorrow will be another day and you might get lucky on that. Do not hesitate to copy a playing style. Imitation is not cheating. It is in fact the highest form of flattery. If one player�s chips are piling up, he might be doing something right that you are not. Observe his ways and find out how he is controlling his bets. There are no hard and fast rules in craps but follow your heart all the time. Go to several tables first and see which table you will be most comfortable to join. Observe the different players and the shooters. Assess the general situation in every table. The general aura of a table will be very important. If you are surrounded by a pool of players who are all getting heated because of losses, that table might not give you good vibes and you will just end up having a bad experience. Play craps to have a good time, so surround yourself with happy players. Another thing to check is the payout rate per table. You have chances to win bigger money in tables offering bigger payouts. The only setback here is that you will probably be playing against the more serious players who are out there to double their money, even triple. Aside from the payout ratio, also check the minimum betting allowed and make sure it fits your budget for the day. If it goes overboard your budget, then even if that table is offering a high payout, it is better to walk away and find another table. Craps is a fast-paced and lively game so your energy level should be up for this. It is a chain reaction without you knowing it. It will affect your play, your mental attitude and your bets. Online Casino Edition - All Rights Reserved.